I pulled out this baby quilt and basted it this weekend. I decided to hand quilt it with some perle cotton. That's such a nice and relaxing thing for me to do later in the evenings. Should just take a few nights more to finish up. We spent one last beautiful weekend at my parents cottage. I hear the weather is about to change and get a lot colder, so I'm glad we took the opportunity to enjoy it. We missed out on having campfires this summer since it was so hot but we made up for it this weekend. Now it really seems like fall is here to stay. I hope you had a good weekend, too! Sorry,I must have published twice, and missed that typo. there is nothing like sitting around a campfire in fall. We had one in our fire pit this past weekend. 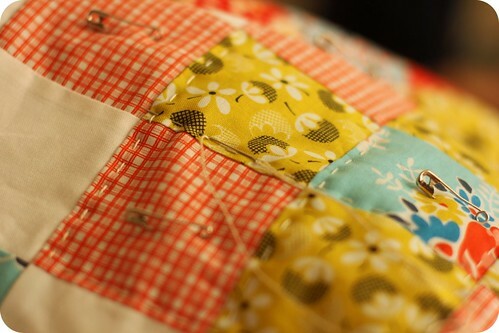 I love hand quilting. Especially baby quilts as they are so easy to handle. Your fabric on this quilt is beautiful. Your quilt is very creative and beautiful design.I love the creative design in quilts.